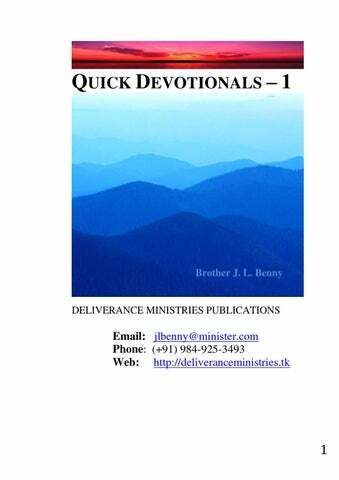 Quick Devotionals, to receive messages for your knowledge and spiritual edification. “BELIEVE IN JESUS” MEANS Bible says, “God so loved the world that he gave his only begotten Son, that whosoever believes in him should not perish, but have everlasting life.” (John 3:16) What does it mean by „believe in Jesus? „ God wants to tell everyone who believes in him, that they should also believe the following: 1. 2. 3. 4. My people should believe my Words. My people should believe my Promises. My people should believe my Prophecies. My people should believe my Power. 1. Heaven and Earth shall pass away, but my Words shall not pass away (Matthew 24:35). a. The Word of God is living and powerful, and sharper than any two-edged sword, piercing even to the dividing asunder of Soul and Spirit, and of the Joints and the marrow, and is a discerner of the thoughts and intents of the heart (Hebrew, 4:12). b. God‟s Word is Truth. (John 17:17) c. His Word runs very swiftly. (Psalms 147:15) d. His Word is the food by which we live. “Man shall not live by bread alone, but, by every word that comes out of His mouth.” (Deuteronomy 8:3, Matthew 4:4) 2. God made promises for His Children: a. God‟s promises belong to his children; those who love him, and his commandments. b. God made promises to fulfill them. c. God wants his people to believe each one of his Promises. 3. God‟s Prophecies are True: a. His prophecies will certainly come to pass. b. God‟s Children should not be ignorant of his Prophecies so that they may recognize them, and not wonder and stare like others, when they are fulfilled. 4. God‟s people must know the power of their God: a. God is almighty. b. Mightier than the heathen Gods. c. Nothing is impossible to God. d. Nothing can stand against him. e. Read the Bible and know the power of your God. f. Unless you believe and act on these, your confession that you believe in Jesus is not useful in anyway. BE PARTAKERS OF THE DIVINE NATURE “His divine power has given us ever thing we need, for life and godliness, through the knowledge of him that has called us to glory and virtue. Through these he has given us exceedingly great and precious promises, so that by these you might be partakers of the divine nature.” Ever wonder why promises are given? “So that, by these you might be partakers of the divine nature, and escape the corruption in the world caused by evil desires.” (2 Peter 1:3, 4) For this reason, make every effort to add these things to your faith: 1. To your faith -- goodness 2. To your goodness -- knowledge 3. To knowledge -- Self-control 4. To self-control -- patience 5. To patience -- godliness 6. To godliness -- brotherly kindness 7. To brotherly kindness -- Love (charity) For, if you possess these qualities in increasing measure, they will keep you from being ineffective and unproductive in your knowledge and work of our lord Jesus Christ. But if any one does not have them, he is short-sighted and blind, and has forgotten that he has been cleansed from his past sins. Therefore, brothers, give diligence (steady attention and effort) to make your calling and election sure; for if you do these things, You Shall Never Fall. “And you will receive a rich welcome into the everlasting kingdom of our Lord and Savior Jesus Christ” (2 Peter 1:5-11) Peace be with you! Amen! ENDURANCE Hebrew Chapters 11 & 12 We know many heroes of faith: By faith Abel offered God a better sacrifice than Cain did. By faith Enoch was transformed that he should not see death. By faith Noah, when warned about things not yet seen, in holy fear, built an ark to save his family. By faith Abraham, when he was called to go out into a place which he should later receive for an inheritance, obeyed. Likewise, Moses and Joshua believed that their God was all powerful, and led the people of Israel into the Promised Land. Think about Samson, David, and Samuel the prophet and so on.JESUS is the perfect example of our hero of this age, from whom we can learn ENDURANCE. v1: Therefore, we also, let us lay aside every weight and the sin which so easily ensnares us, and let us run with endurance the race that is set before us. v2: Looking unto Jesus, the author and finisher of our faith, who for the joy that was set before him endured the cross despising the shame and has sat down at the right hand of the throne of God. v3: For, consider him who endured such hostility from sinners against himself lest you become weary and discouraged in your minds. Endure Godâ&#x20AC;&#x;s chastening v5: Do not forget the exhortation which speaks to you as sons, â&#x20AC;&#x153;My son, do not despise the chastening of the Lord, nor, be discouraged when you are rebuked by him. v6: For who the Lord loves, he chastens, and scourges every son who he receives. v7: If you endure chastening, God deals with you as with sons for, what son is there whom a father does not chasten? v8: But, if you are without chastening, of which all have become partakers, then, you are illegitimate and not sons. EXHORTATION Hebrew 3:12 to 19 v12: Take head brethren, lest there be in any of you an evil heart of unbelief in departing from the living God. v13: But, exhort one another daily while it is called Today, lest any of you be hardened through the deceitfulness of sin. v19: Israelites could not enter in because of unbelief. v15: Today, if you hear his voice, harden not your hearts as in the provocation of Israelites. v16: For who when they had heard did provoke? Did not all that come out of Egypt by Moses? v17: But, with who was he grieved 40 years? Was it not with them that have sinned, whose carcasses fell in the wilderness? v18: And to whom swore he that they should not enter into his rest, but to them that believe not? v19: So, we see that they could not enter because of unbelief. Ch4:9: There remaineth therefore a rest to the people of God. v11: Let us labor therefore, to enter into that rest, lest any man fall after the same example of unbelief. AFRAID OF YOUR PROBLEMS AND TROUBLES? Read these verses from the Bible: Matthews 14:22-32, Mark 6:45-52, John 6:15-21 1. 2. 3. 4. 5. 6. 7. 8. 9. 10. 11. “Jesus constrained (forced) his disciples to get into a boat and go before him unto the other side. When the boat was in the midst of the sea, The wind was contrary (against,ఎదురుగాలి వీచింది) So the boat was tossed with waves. It became difficult for them to row the boat forward. Circumstances were not favorable. (గాలివాటం అనుకూలంగా లేదు) In the fourth watch of the night Jesus went unto them, walking on the sea. When the disciples saw him walking on the sea, they were troubled, saying, it was a spirit; and they cried out for fear. But Jesus spoke unto them, saying, “Be of good cheer; it is I, be not afraid”. Then they willingly received him into the boat. And He went up unto them into the ship; and the wind ceased. And they were so much amazed in themselves beyond measure, and wondered. Dear believer, Are you in troubles and problems? Is your boat of life tossed about and not able to go forward? 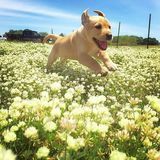 Is the wind against and the circumstances not favorable? Don‟t worry. The disciples of Jesus were also under the same conditions many times. Keep your faith and don‟t lose heart. Jesus whom you believe will come into your life. God says, “Because he has set his love upon me, therefore I will deliver him; I will set him on high, because he has known my name. He shall call upon me, and I will answer him. I will be with him in trouble; I will deliver him and honor him, With long life will I satisfy him, and show him my salvation.” This is God‟s Promise to his people, who had known His name, and had loved Him. Do you believe your God? If yes, then, believe His promises and be happy. Know that HE is with you always! Amen. GOD‟S WILL TOWARD ALL HUMANITY “God our Savior wants all men to be saved, and come to the knowledge of the truth.” (1 Timothy2:4) Q: How can we be saved? “If you confess with your mouth „Jesus is Lord‟, and believe in your heart that God raised him from the dead, you will be saved.” (Romans 10:9) Q: Is it all? Is it enough? Yes, of course. But, you also need to follow the details. Let us examine the following details: “…Let all Israel (people) be assured of this: God has made this Jesus, whom you crucified, both Lord and Christ.” When the people heard this, they were pricked in their heart, and said to Peter and the other Apostles, “Brothers, What shall we do?” Peter replied, “Repent and be Baptized, every one of you, in the name of Jesus Christ for the forgiveness of your sins, and you shall receive the gift of the Holy Spirit.… and with many other words he testified and exhorted saying, Be Ye Separated Yourself from this crooked generation, and Be Saved.” (Acts 2:36-40) How can we continue after being saved? “Then they that gladly received his word were baptized; and the same day there were added about three thousand souls. And they continued steadfastly in the apostles‟ doctrine and fellowship, and in breaking of bread, and in prayers. Fear came upon every soul: and many wonders and signs were done by the apostles… and the Lord added to the church daily those who were being saved.” (Acts 2:42, 43) SUMMARY: Points to follow to be saved from Eternal destruction: 1. Confess with your mouth, Jesus Christ as your savior. 2. Believe in your heart that God raised Jesus from the dead. 3. Repent for your sins with Jesus and ask him for forgiveness. 4. Be baptized. 5. Be separated from the wicked generation. 6. Be in fellowship with the saved people, following the Apostles doctrine, and participate in breaking bread and in prayers. 7. You shall receive the Holy Spirit, and shall be bestowed with the gifts of the Holy Spirit. 8. When the Holy Spirit comes upon you, you will receive power, and you shall be witnesses unto the Lord in yourplace, in your surroundings, and unto the uttermost parts of the world. NEW INTIMACY “No longer do I call you servants; for the servant does not know what his master is doing; but I have called you friends, for all that I have heard from my father, I have made known to you.” (John 15:15) Jesus told us everything that Father God wanted us to know and I would like to remind you certain things in this context. Salvation is made ready for the sinner by the blood of Jesus Christ, because it is God‟s will that everybody should be saved. 2. (V:4) To those who are saved, he said, “you are already clean, because of the word I have spoken to you. 3. Abide in me, and I abide in you (as a branch to the vine – main trunk – except you abide in me you cannot do anything)”. 1. God wants us to bear much fruit (be blessed more). Now, how can we bear much fruit? – If we abide in him and He in us, we bear much fruit. v:5 Whosoever abides in me and I in him, bears much fruit. v:8If we bear much fruit, our Heavenly father will be glorified and thus we become his disciples. It is God‟s will that everybody should become his disciple. But, it is all conditional. v:7 - If you abide in me, and my words abide in you, you shall ask what you will and it shall be done. 1. So, How can we abide in him? – In verse 10 He says, “If you keep my commandments you shall abide in me”. 2. What is the commandment that we need to keep? In verse 12, He says, “This is my commandment, that you should love one another, as I loved you”. 3. You should also have greater love. In verse 13 He says,” Greater love has no one than this that a man lay down his life for his friends”. It is God‟s will that we should love one another . 4. You are my friends, if you do whatever I commanded you. Conditions: If you come to me, then I will come to you. If you open the door, then I will enter. If you confess your sins, I will forgive your sins, and cleanse you from all your unrighteousness. “I stand at the door and knock. If anyone hear my voice and opens the door, I will come unto him and eat with him, and he with me.” Do you hear him knocking at your heart any time? If so, do you want to open your heart to him today? If your answer is “Yes”, What a great privilege it is for you to eat with Him, and He with You! This is a new real “Intimacy” with Jesus, a wonderful person that ever lived on the earth. He lived only 33 and half years and taught only 3 and half years about the Kingdom of God. But, the whole world is looking to him for Peace. He is the author of Peace. Do you like to develop intimacy with this person? Call on him even now. He is waiting! NAME ABOVE EVERY NAME “God has exalted him (Jesus) and given him a name which is above every name.” (Philip 2:9) What is the greatness of Jesus? “Without controversy great is the mystery of godliness (of Jesus): God was manifest in the flesh, justified in the spirit, seen of angels, preached unto the nations, believed on in the world, received up into glory.”(1Timothy 3:16) His birth, teachings, personal holy life, his authority over sickness and demons, his wonders and miracles, and raising the dead. He was crucified and dead, but he rose again from the dead. He appeared to many people after resurrection, for forty days, and ascended up into heaven while five hundred and odd people witnessed. That ascension was seen not only by those people who were present on Mount of Olives, but also by Satan and the devils, by all heavenly things and earthly things, and by the entire creation. Therefore, all things obey and bow down at the sound of this unique, great and victorious name- the name of JESUS. „JESUS‟ name is the name above every name. Amen! and come short of the glory of God” (Romans 3:23). Thus, the nature of humanity has become „sinful‟, and the fruit of that is being exposed in their thoughts, words and deeds. The way of their life is managed by the worldly spirit, and as a result, the Spirit, the Nature, and the Power have become wicked (worldly). The spirit instead of being good has become evil. The nature, filled with hatred, jealousy, envy, and so on, and the power is used to harm godly and good people. “He that commits sin is of the devil; because the devil has been sinning from the beginning. For this purpose the son of God was manifested, that he might destroy the works of the devil” (1 John 3:8). “We know that whosoever is born of God does not continue to sin, but he that is born of God keeps himself, and that wicked one cannot touch him. We know that we are of God, and the whole world is lying in wickedness” (1 John 5:18). “Therefore, if anyone is in Christ, he is a new creation; the old things are passed away; behold, all things are become new” (2 Corinth 5:17). The three things that have become new are: 1. Now you are a totally different person, reflecting Jesus Christ, in this world. The reason why He is calling people to shed the old self and have new man in their lives, is to show them to the world, and to show how a sinful man can be transformed into a divine person. Would you like to become a new creation? Come, and accept the Lord Jesus Christ as your personal savior. Repent for your sins and get cleansed and receive the Holy Spirit who will guide you and lead you into perfection. You will be transformed into the likeness of Jesus Christ. Go into your room, kneel down and pray. Invite Jesus into your heart (life), and rest of the things will be taken care of by the Spirit of God. May God use you as a wonderful new tool for His glory. Amen! RESTORATION God Announced the Restoration of Israelites (Ezekiel 36: 24-38) Vision of the Valley of Dry Bones (Ezekiel 37: 1-10) Vision Explained (Ezekiel37: 11-14) Restoration of the back sliden and fallen down (dead) Christians is also possible in the same way as it was possible with Israelites. Today, as we see many Christians have gone away from God and are living a compromised life with the world. We can say they are living, but are dead. Where do we find them? They are right beside us as neighbors, as friends, and as relatives. Have you ever thought of these dead bones? They are covered under our foot, under the mats. Many good Christians and godly people do not know that there are numerous Christians dead spiritually. Imagine for a moment and if you can see them in your spirit. When I think and picture this, am afraid if I‟m responsible for their salvation. What do you say? Don‟t you also feel the same when you see the picture of dead Christians? We must realize that God has not forgotten them. It does not mean that you should give them good nourishing physical food. That cannot make the dead bones come alive and become strong. This is not about physical treatment and needs. But living Christians should prophecy to the dead Christians about God‟s love and his rejuvenating power. Then the Holy Spirit may come upon them and give life again. First, the word of God should be preached to the backsliding Christians. God will speak to them and lift them from that situation by the power of the Holy Spirit. It is the will of God that everyone should be saved, even a prodigal son lost to the world, and the man who while going from Jerusalem to Jericho fell among thieves, also should be saved. Those who fled from God loving the world and its passions should come again to the savior. If you are one who knew and tasted the love of Jesus toward sinners, don‟t just keep quiet, just as God instructed Prophet Ezekiel, You prophesy to them to come to life, they are sure to become saints. It is God‟s will and he will do it. Will you do your part? This message is not to tell you to donate money for the poor that may help only to extend their life on this earth, but, to tell you to preach the word of salvation and restoration, which will definitely help them to rise and attain the Eternal Kingdom of God. Would you like to start talking about the love of God and his salvation with others who are lost in the world? Do you want to be a Good Samaritan? Is not the Spirit of God stirring you to restore His people? Then, go ahead. Read the book of Acts and other letters which will guide you to fulfill your task. The Lord spoke to Paul saying, “Be not afraid, but, speak, and hold not thy peace; for I am with you, and no man shall set on you to hurt you; for I have many people in this city.” (Acts 18:9-11) Dear Brothers and Sisters, unless you talk to the spiritually dead Christians, they will remain dead, and will be lost forever. May God enable you and strengthen you to restore His people. WE ARE ALL JOSHUAS 1. God called Peter, like He called Abraham. He called Paul, like He called Moses. We are all Joshuas, who enter into the Promised Land, and lead many into it. Joshua was a fighter of our Lord; likewise, we are his fighters too. Go only ahead, never go back. The land is promised to you; donâ&#x20AC;&#x;t be afraid of any worldly giants. Nothing will be a problem for you. Always take the Tabernacle (the presence of God) with you. That is your Power. Then nobody can stand against you. So, Be Bold, Go Forward, Lead Godâ&#x20AC;&#x;s people; Strengthen them, Encourage them, Stir them, Move them, and Take Care of them. SANCTIFICATION Sanctification Through Union With Christ In His Death And Resurrection. Deliverance from the Power of Indwelling Sin (Romans 6) 1. By union with Christ in death and resurrection  Those who were baptized into Jesus Christ were baptized into his death.  We are buried with him by baptism into death.  We have been planted together in the likeness of his death.  Our old man is crucified with him, that the body of sin might be destroyed that henceforth we should not serve sin.  He that is dead is freed from sin.  If we are dead with Christ, we believe that we shall also live with him.  Christ being raised from the dead dies no more. Death has no more dominion over him.  The death he died, he died to sin once for all; but the life he lives, and he lives for God. 2. By counting yourself dead to the old life, and by yielding to the new life  In the same way, count yourselves dead to sin but alive to God in Christ Jesus. Therefore, let not sin reign in your mortal body, that you should obey its evil desires.  Do not yield the parts of your body unto sin, as instruments of unrighteousness. But yield yourselves as those that are alive from the dead. 3. By deliverance from the principle of works-Principle of law  For sin shall not have dominion over you; for you are not under the law but under grace.  For the law of the Spirit of Life in Christ Jesus had made me free from the law of sin anddeath.  Now being made free from sin, and become servants to God, you have your fruit unto holiness, and the end everlasting life.  For the wages of sin is death, but the gift of God is eternal life. 4. By deliverance from the old nature producing righteousness (Romans 8)  If the Spirit of God lives in you, you are controlled by the spirit, but not by the sinful nature.  Those who are led by the spirit of God are sons of God.  Now if we are children, then we are heirs-heirs of God and joint heirs with Christ, if indeed we share in his sufferings in order that we may also share in his glory.  Being sanctified children of the most high God, let us wait patiently for the glorious deliverance ahead. We are saved by hope.  Hope that is seen is not hope; but if we hope for that which we see not, then let us wait for it with patience.